The SQL DEGREES function is one of the Mathematical function, which is used to convert the angle measured in radiant to an approximately equivalent angle measured in degrees. 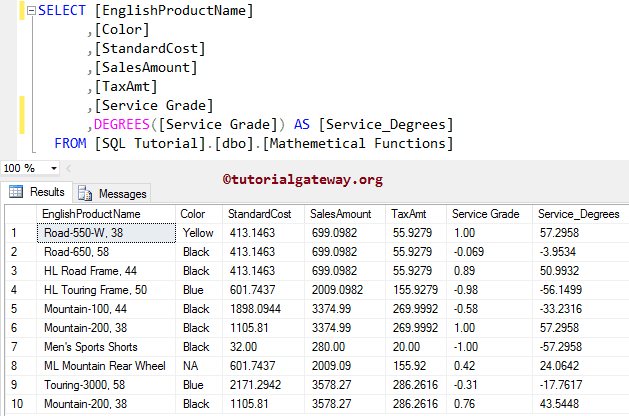 In this article, we will show you, How to use/write SQL Server DEGREES function with a practical example. Numeric_Expression: The DEGREES function accepts exact numeric, or an approximately numeric data types. Remember that, this function will not accept the Bit data types. 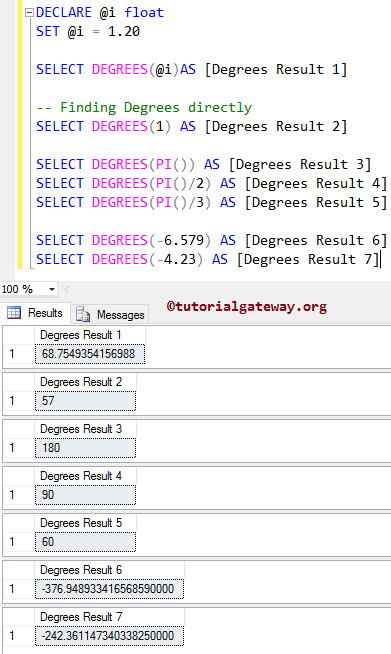 The SQL server DEGREES Function is used to convert user specified radians to an approximately equivalent angle in degrees. Within this Degrees function example query, Below lines of code is used to declare float variable. Next, we are assigning the random value to it. Next, we are finding the degrees of radiant @i. We also assigned new name to the result as ‘Degree Result 1’ using SQL ALIAS Column. For this demonstration, We are going to convert all the records present in the [Service Grade] column to equivalent degree values using this DEGREES Function.